Trending at $76.41eBay determines this price through a machine learned model of the product's sale prices within the last 90 days. 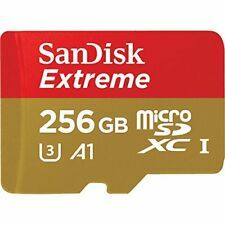 SanDisk Extreme Pro Micro SDXC UHS-I U3 A2 V30 Card 256GB Barely Used. Condition is Used. Shipped with USPS First Class Package. Barely used for barely over a month. Works perfectly. Never opened or used, got it from my cellphone company during promotion period. 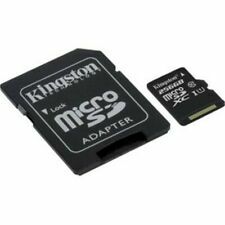 Form factor: SDHC (16GB and 32GB), SDXC (64GB, 128GB, 256GB) Available capacities: 16GB, 32GB, 64GB, 128GB, 256GB Performance/speed: Up to 170MB/s read & 90MB/s write Card dimension: 0.94" x 1.25" x 0.08" (24 mm x 32 mm x 2.1 mm) Operating temperature: -13ºF to 185ºF (-25ºC to 85 ºC) Storage temperature: -40ºF to 185ºF (-40ºC to 85ºC) Compatibility: For SDHC (16-32GB) cards: Compatible with all SDHC/SDXC and SDHC-I/SDXC-I (UHS-I) enabled host devices For SDXC (64-128GB) cards: Compatible with SDXC and SDXC-I (UHS-I) enabled host devices. Security: Built-in write-protect switch prevents accidental data loss Added Protecti... . Note: By buying from us you agree with all of our policies. Original pictures are also included. Enjoy your adventures without worrying. (With shot speeds of up to 70MB/s and UHS Speed Class 3 (u3)(2) recording, you're ready to capture stunning high-resolution, stutter-free 4K UHD video). Plus, it's built to withstand weather, water, shocks and other less-than-ideal conditions so you can rest assured that it's good to go wherever you go. Lexar 256GB SDXC UHS-I / U3 Class-10. Super High speed, Class-10 performance leverages UHS-I technology (UHS Speed Class 3 (U3) for 256GB capacities) for a read transfer speed up to 633x (95MB). Enjoy shooting longer without changing cards. Lexar 256GB SDXC UHS-I / U3 Class-10 New Card. Super High speed, Class-10 performance leverages UHS-I technology (UHS Speed Class 3 (U3) for 256GB capacities) for a read transfer speed up to 633x (95MB). Lexar 4/pics 256GB SDXC UHS-I / U3 Class-10 New Card. Super High speed, Class-10 performance leverages UHS-I technology (UHS Speed Class 3 (U3) for 256GB capacities) for a read transfer speed up to 633x (95MB). Lexar 2/pics 256GB SDXC UHS-I / U3 Class-10 New Card. Super High speed, Class-10 performance leverages UHS-I technology (UHS Speed Class 3 (U3) for 256GB capacities) for a read transfer speed up to 633x (95MB). UHS bus speed mode UHS-I SDR104. UHS speed class 1. large capacity, UHS-竇?. corresponding, high-speed transfer SDXC card HD video of stable recording is capable of ultra-high-speed model High-speed SD bus interface UHS-竇?. VERBATIM 256GB PRP V30 microSD Cards provides the capability of saving and storing over 40 hours of Full HD video content, or over 50,000 pictures (at 18MP size), up to 50,000 songs, or any combination that your creative mind can develop. Write speeds of up to 90MB/s handle rapid shots, sequential burst mode, and RAW plus JPEG capture with ease. This software makes it easy to recover files that have been accidentally deleted (download required). Class 10 UHS-I, U3 performance allows burst-mode shooting, Full HD and 4K Ultra HD video recording. They are our fastest SDXC cards yet, with transfer speeds up to 90MB/s. You'll be ready to capture ultra-fast action shots and HD video without missing a beat. Model: SDSQUAR. Model : SDSQUAR. Capacity: 256G. Capacity : 256G. Country Origin: China. Country Origin : China. We want you to be 100% happiness with your order and services. Country Origin. 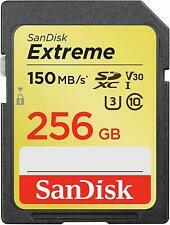 Komputerbay Professional 256 GB High Speed SDXC Class 10 UHS-I, U3 up to 95 MB/Sec Flash Card. Class 10 UHS-I, U3 performance allows burst-mode shooting, Full HD and 4K Ultra HD video recording. They are our fastest SDXC cards yet, with transfer speeds up to 95MB/s. ADATA Premier Micro SDXC/SDHC UHS-1 Class 10 V10 A1 micro SD cards can support Full HD 1080p Video recording, with V10 Video Speed Class certified, users can now record up to 10MB of video per second. Class: 10 (UHS-I Class U3). -Series: EVO plus (MB-MC256D). Water Proof and Safe – Even in Seawater. Outstanding Shock Proof Resistance. -Features Data Transfer Speed: Read: 95MB/s Write: 90MB/. -Product Type: microSD Card. Super High speed, Class-10 performance leverages UHS-I technology (UHS Speed Class 3 (U3) for 256GB capacities) for a read transfer speed up to 633x (95MB). Enjoy shooting longer without changing cards.